Let’s go back to November 8, 2016, the day of the U.S. presidential election. Regardless of your party affiliation or who you supported in the general election, you were probably ready to put politics in the rearview mirror. Now imagine I had told you at the time every major news item that would happen over the next 11 months, from natural disasters to North Korean missile tests to Russian investigations and everything in between. Then I asked you to draw a chart of your prediction for the US stock market, as measured by the S&P 500, over those next 11 months. Would you have imagined something like the chart to the below? Despite all the negative headlines and scary stories about what’s happening in the world, the stock market has been very calm, delivering strong returns month after month. This chart shows a steady positive return with very few bumps along the way. Yet again we see a steady march up and to the right. It’s the same across the board among nearly all asset classes. In fact, the only asset class that is down year-to-date in 2017 is commodities. This has been an incredible year for investors so far, with large cap US stocks up 14%, small cap US stocks up 11%, international stocks up 20%, emerging markets stocks up 28%, and REIT’s up 6%. Most bond indices are even up on the year, despite continued rate increases from the Federal Reserve. Not only have we have seen incredibly strong returns across the board this year, we’ve also seen almost unprecedented low levels of volatility. 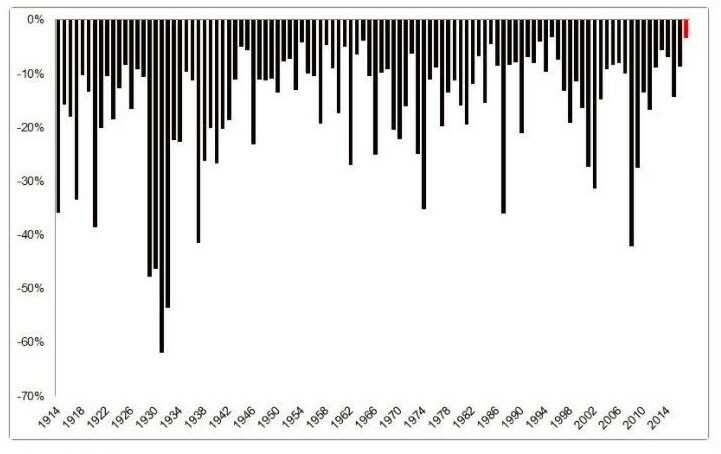 Below is a chart that shows the biggest drawdown, or drop in the S&P 500 every year since 1914. You’ll notice 2017 stands out as the tiny red line on the right. The worst drawdown we’ve seen this year is just 2.8%, as measured from peak to trough. The average intra-year drawdown like this over the past 100 years is 16% and the smallest drawdown over those 100 years was 3.3% in 1995. The VIX, which is an index that measures the volatility of the market, recently hit its lowest reading ever! On top of record low volatility and strong performance across all asset classes, the global economy appears to be in great shape. Most leading economic indicators are positive and countries around the world are experiencing an increase in growth. Some economists believe growth could continue to pick up in the short-term, particularly in the U.S. if the Trump administration is successful in pushing forward their tax reform plans. At this point you’re probably waiting for us to ruin your party and tell you that a correction or a downturn is inevitable. Well guess what, it is! Unfortunately, we don’t know when that might happen and while it could happen tomorrow, it might not happen until next year, or the year after. We do know the stock market can’t go up forever and usually downturns happen when you least expect them to. Despite the positive current market conditions, there are still plenty of reasons to be cautious. Stock valuations, particularly in the U.S., still look high compared to virtually any historical valuation measures. The Federal Reserve is expected to continue to slowly raise interest rates and reduce its balance sheet. While in the long run this will be good news for bond investors, there will be some short-term pain because bond prices go down as interest rates go up. There are many indications that inflation could be on the rise as well, something we haven’t seen in quite some time. There are also growing geopolitical tensions among many countries and the threat of a conflict hurting the global economy is always present. Mentally prepare for negative returns. It’s likely been a long time since you have seen significant losses in your portfolio and the longer they take to show up, the worse they will hurt when they do. While nothing can really simulate the feeling of losing money, try to imagine what it will feel like and remind yourself from time to time markets must go down before they can go up. Reassess your long-term financial plan. The past eight years might have put you in much better shape to meet your long-term goals so maybe you don’t need to take as much risk in your portfolio anymore. We’d be happy to help you think through this. Make sure your cash reserves are sufficient. 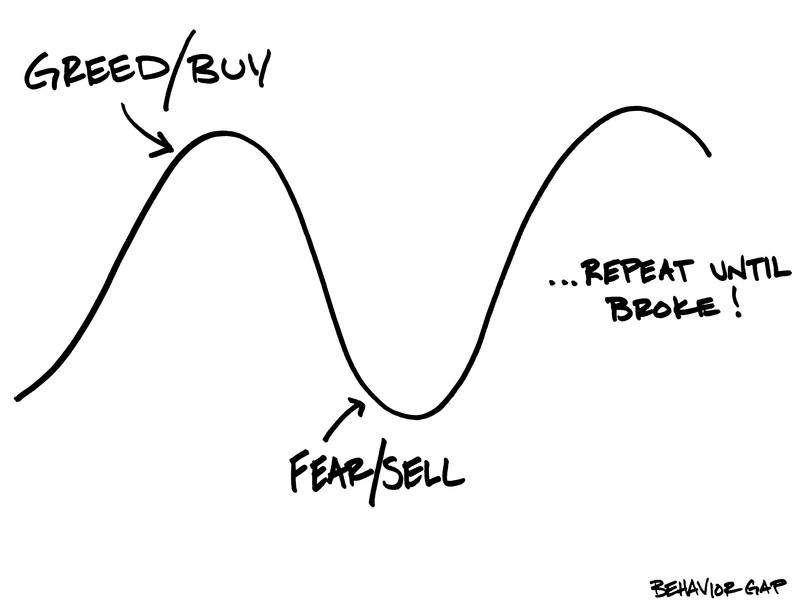 While it hurts to have cash sitting around earning next to nothing, if the market does go through a downturn you will be happy you don’t have to sell anything while it’s down. Remember why you have a diversified portfolio. Even though everything seems to be going up right now, not everything is up to the same degree. When a downturn hits, the same will be true. Enjoy it! We know we spend a lot of time reminding clients the markets won’t always go up like this, but sometimes you just need to sit back and enjoy the ride. We’ll leave you with this sketch from the great columnist and financial advisor Carl Richards. Right now, you probably feel like you are at the top of one of those waves. Just remember that eventually the tide will turn, and our job is to keep you from making the wrong decision at the wrong time!